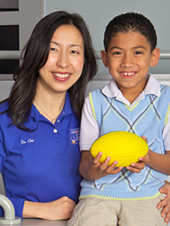 Dr. Cho is committed to providing excellent care for her patients and is a Diplomate of the American Board of Pediatric Dentistry. Dr. Eunha Cho, a native Southern Californian and a loyal Bruin, received her bachelor’s degree, her dental degree, and then completed her residency training in pediatric dentistry at UCLA. She has returned to her alma mater to teach dental students and remains active in her dedication to educating future colleagues.